It’s usually Kai who draws the short end in a situation like this involving Kaya, so he can’t pass up this chance to get even. Just make sure to stay out of nuke-range after this Kai. cool video. first is best. Where do people find these bugs?? 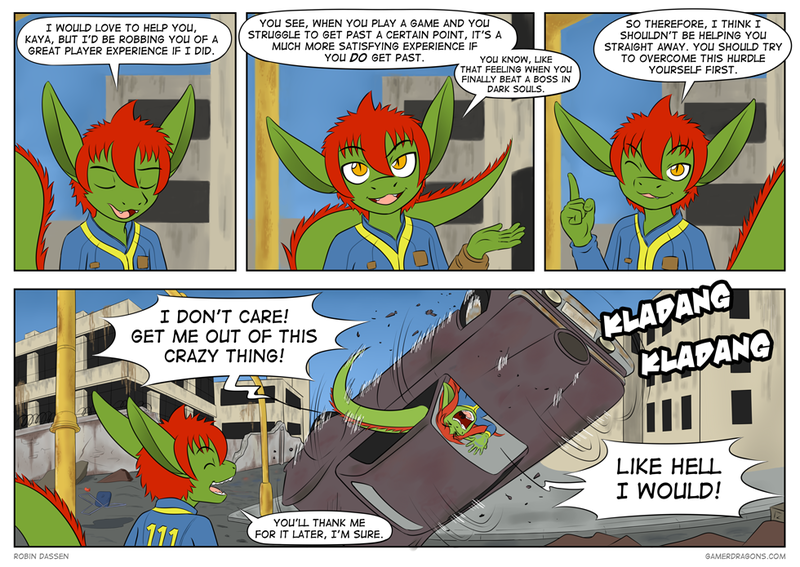 I have yet to see anything buggy about fallout 4. Actually, this situation is familiar. My wife once played this one game, I think it was called ‘the last story’ or something and there was this one boss that was a giant squid. She tried to take it down like four or five times, but always ended up getting beaten in the process…so she asked me for help. I felt kinda bad when I took that thing down on my first attempt after getting a handle on the controls…yes, I had never played the game before that. But that’s just the difference between someone whose track record is 50 hours sunk into one game in one week and someone who just casually plays games when there’s time. Kaya’s tail is going to take some damage if she keeps it hanging out the window.